As a rule I like new things: new tech, new movies, new music and particularly new restaurants. Sometimes, however, it’s comforting to return to somewhere from the past, and find it just as you left it. 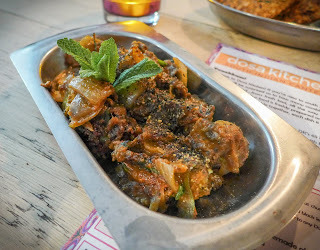 Dosa Kitchen may have changed postcode since we last ate there, but as we pulled our chunky wooden seats under the table and scanned the menu, the sense of déjà vu was very welcome. I reviewed it a couple of years back when it was popping up in the evenings in a community office block on Westgate Road called The Beacon. 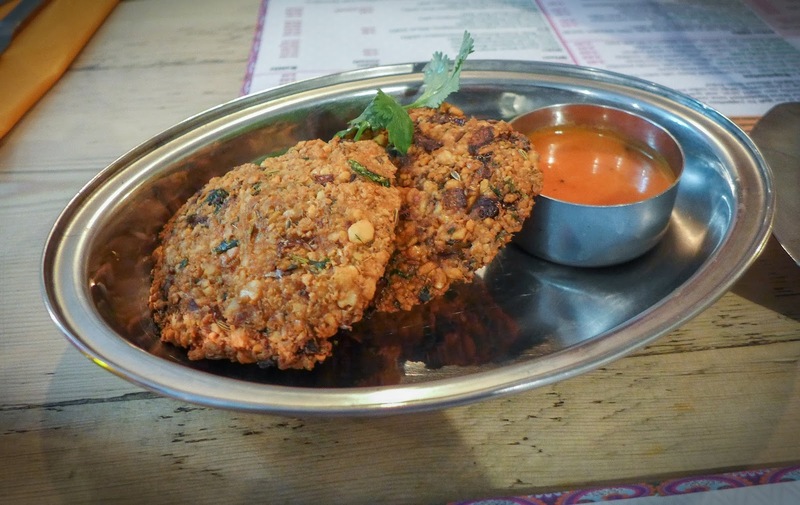 There was an incongruous, improbable thrill in eating such thoroughly delicious south Indian food, cooked with care and served with real warmth, in a venue which, back then during the day, offered nothing more ambitious than baked spuds. Dosa Kitchen popped down later that year, and it’s been defunct for so long that I feared whether its promise to find a permanent site would ever be realised. 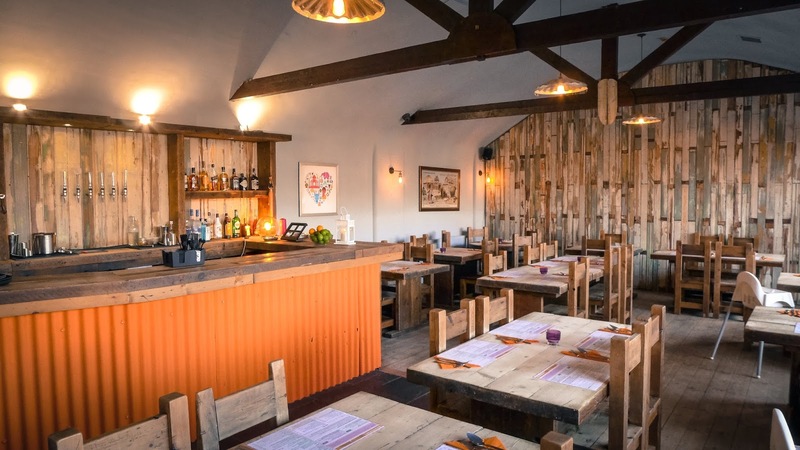 Then, last December, they flung open their doors in what had been Longhorns’ Jesmond site, just round the corner from Cal’s Own and close to the recently opened Branches. 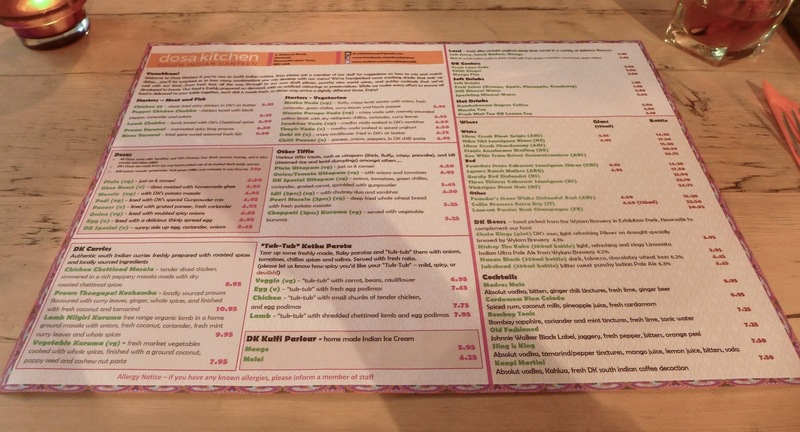 I checked the menu against the 2016 original and very little has changed. 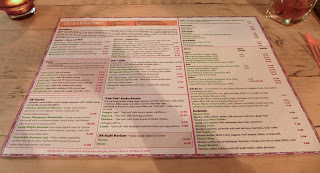 The same list of beguiling savoury breads, cakes and doughnuts - who could ever resist ordering uttapam or idli? - with a similar bunch of chutneys and curries to dredge them through. This is a good thing. We ordered starters of chilli paneer, and lamb chukka. 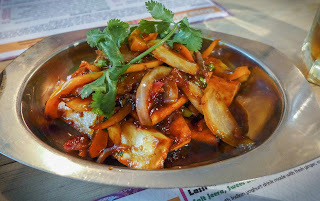 The former features lengthy rods of the firm cheese, tossed in an addictive, almost sweet and sour chilli sauce, along with still-crunchy onions and peppers. 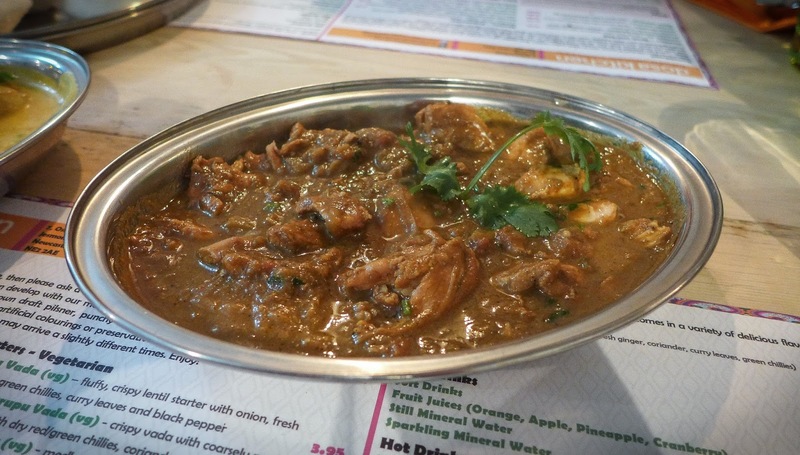 The lamb was a dry-cooked dish of tender nuggets of meat and onions in a sauce that featured dark, almost wintry spicing (it suited the Beast from the East, which was raging outside). I detected clove, black pepper, fennel and cinnamon - or maybe cassia. Parupu vada - flattish, greaseless discs made from coarsely pounded yellow lentils - were texturally fun, tasting about as wholesome as anything can after having been retrieved from a fryer. Flavoured with curry leaves, they came apart in steaming clumps, the better for dipping into their spiced tomato chutney accompaniment. 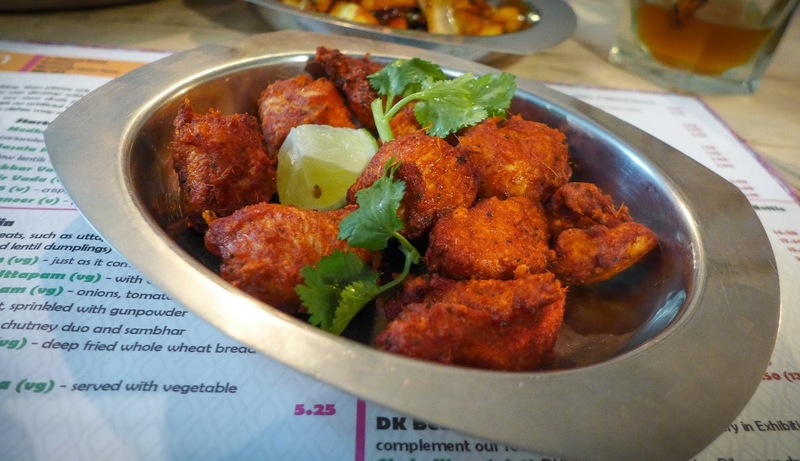 A plate of the enigmatically named chicken 65, in which pieces of the bird are marinated then fried in a light spiced batter, completed the preliminaries in fine, mouth-tingly style. 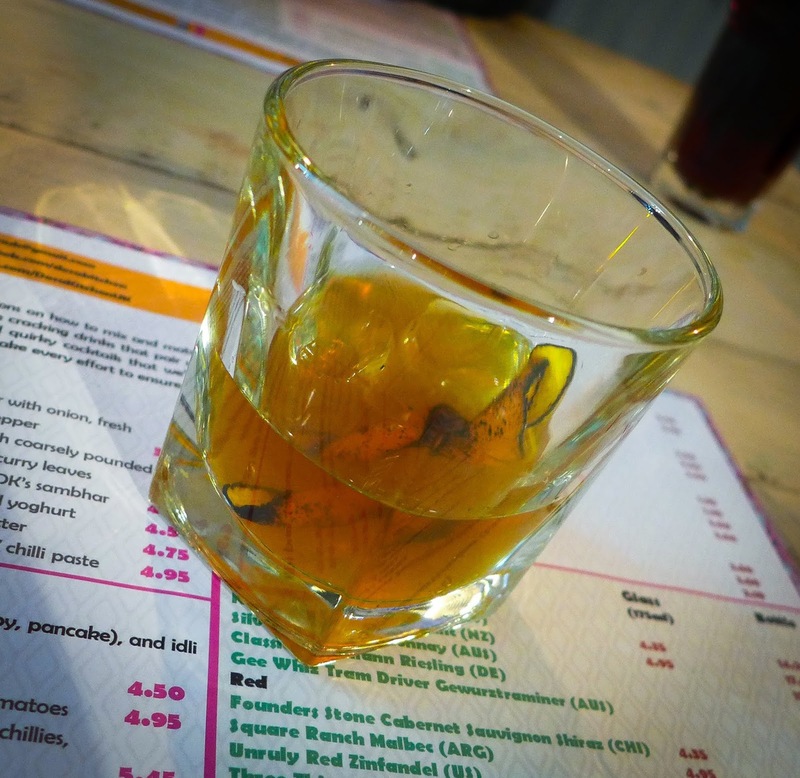 One advantage of permanent premises is the option of taking a booze license. Dosa Kitchen have put theirs to good use, getting Wylam Brewery to knock up a bespoke Pilsner. A short wine list is hobbled by not offering by the glass wines best suited to aromatic, spicy food - Riesling, Gewurztraminer and Pinot Noir. Thus denied, I ended up ordering an Old Fashioned, based here on Scotch and, in an interesting sub-continental twist, jaggery. It was well made, a neat balance having been struck between sweet, bitter and aromatic. A pair of curries contrasted nicely. 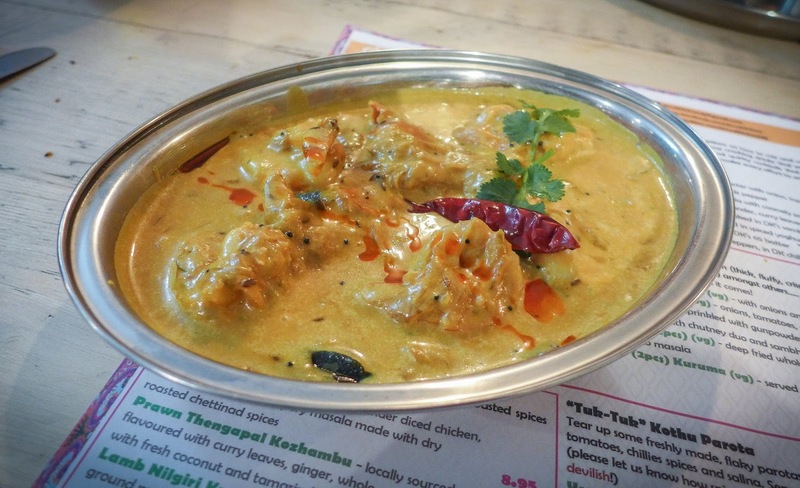 Prawn Thengapal Kozhambu was notable for some just-barely-cooked crustacea in a coconut milk based gravy that was gently singing with ginger and whose richness was kept in check by the tartness of tamarind. If you were to design a curry for Mrs Diner from scratch, this would pretty much be it. The chicken Chettinad Masala used a spice blend similar to that of the lamb chukka starter, with black pepper the star of show. It’s nice to see it being used properly as a spice, as opposed to a “seasoning”, which it really isn’t. 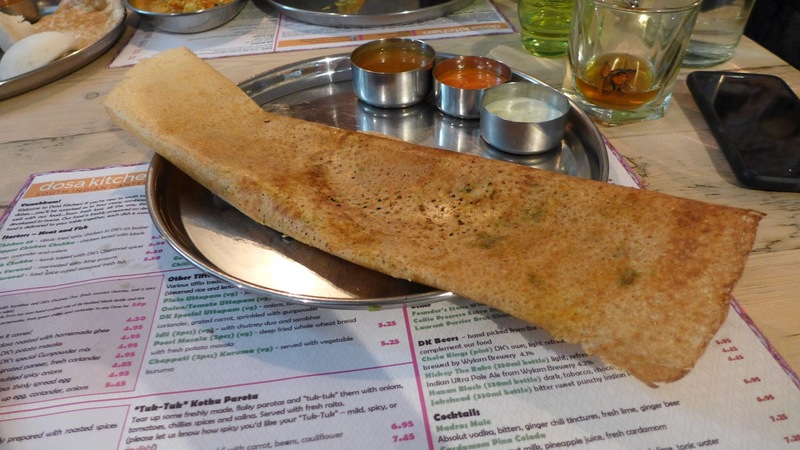 For mopping, dredging and scooping we ordered a cheese dosa, an uttapam and a serving of idli. The dosa was - hurrah! - just as tremendous as I remembered, a vast, crisp, rolled pancake of fermenty-soured lentil and rice batter. 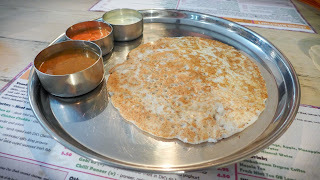 Mrs Diner preferred the uttapam which I think is made from the same stuff, but is thicker, like a massive crumpet. Idli were UFO-shaped steamed dumplings that tasted of little themselves but made a nice blank canvas for flavours elsewhere, such as the fresh coconut chutney, or the deep and complex sambhar. There is a real lightness to the food at Dosa Kitchen, which is partly to do with judicious use of fats - no pools of ghee on the curries here - but also down to the almost ethereal whisper of sour tamarind and fragrant curry leaf which runs through a number of the dishes. The food refreshs even as it satisfies. Having said that, we actually finished in a blaze of dairy. 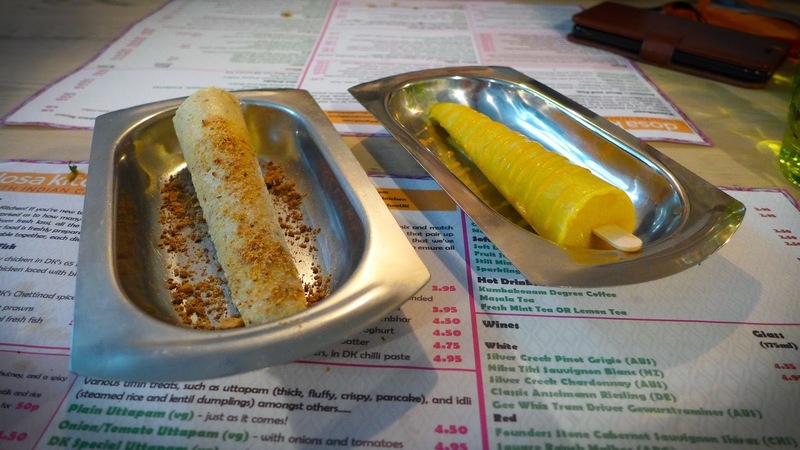 Kulfi - India’s answer to ice cream - is made with whole milk that is cooked down until it becomes caramelised. 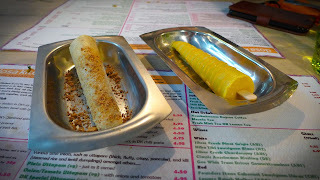 Dosa Kitchen’s tasted like the real deal, with both the mango and roasted nut versions having an addictive chewiness. 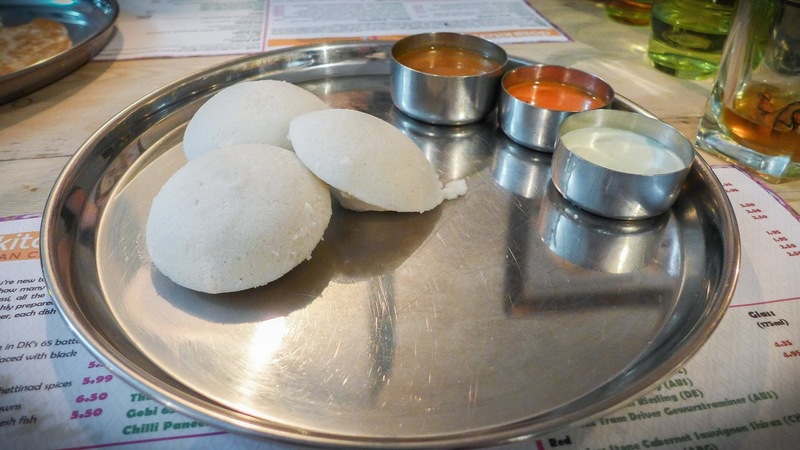 A couple of tiny niggles: if, as we did, you order a range of tiffin, you’ll receive a number of duplicate pots of the two chutneys and sambhar. No great disaster, but why not expand the range a bit? Second, the fact of having secured proper restaurant premises does slightly temper the “I can’t believe I’m eating this here!” magic of the original. Maybe they could address this by offering daily specials in addition to the original menu, which as I’ve said, has survived pretty much intact. None of this, however, changes the fact that Dosa Kitchen appear to have successfully made its transition into bricks and mortar. In 2016 we visited for the first “Sunday Sapaad” feast just after the restaurant had opened, when things were understandably a little frenetic and disjointed. Service is now slick and friendly, and Chef Sudharsan Murugave’s deft mastery of Tamil Nadu spicing is as spot on as ever. As long as this lasts, we’ll be back again and again. "the almost ethereal whisper of sour tamarind"
"an addictive, almost sweet and sour chilli sauce"